Caleb Jones, Keoni Texeira and Dennis Cholowski provided plenty of offense from the blue line in recent Portland Winterhawks seasons. Often, the partner there to counter the offensive instincts of those defensemen was Brendan De Jong. Now 20 years old and in his fifth season with the Winterhawks, De Jong, 6-5 and 200 pounds, is playing his biggest role yet. Surrounded by talented young defensemen, De Jong is making the most of his final season in junior hockey. De Jong recently became the eighth player in Winterhawks history to play in more than 300 regular-season games. Tuesday's game at Tri-City should be regular-season game No. 308 for De Jong. If he plays the remaining games, he will finish third on the franchise list at 324 regular-season games, two behind Kevin Haupt's 326 from 1994-99 and 27 fewer than leader Troy Rutkowski's 351 games from 2008-13. "I'm proud of it. It's for sure an honor," De Jong says. "I respect the Winterhawks for keeping me around this long. I know it's pretty rare for a player to play five years with the same team." De Jong might have risen to second on the Hawks' all-time list for games played if not for a recent concussion that sidelined him for eight games, including the entire East Division road swing. Winterhawks VP/GM/coach Mike Johnston, who was coaching the Pittsburgh Penguins when De Jong started his Western Hockey League career, says the defenseman has played his best hockey since returning from that injury. With six goals and 15 assists in 41 games this season, De Jong is on pace to surpass his career high for goals (eight) and points (25). His career numbers are 23 goals and 58 assists and a plus-6 rating in the regular season. He has two goals and two assists in 28 playoff games. But De Jong's value isn't measured by offensive numbers. It's his understanding of the game and willingness to play a role, which for him is more about limiting opponents than about scaring goalies. A Victoria, British Columbia, native, De Jong has played as a defenseman since early in his youth hockey days. He's enjoyed it because defensemen get more playing time than forwards. He has been a mainstay on the blue line since he arrived in Portland, where he was seen as long on potential because he skated well for his size. 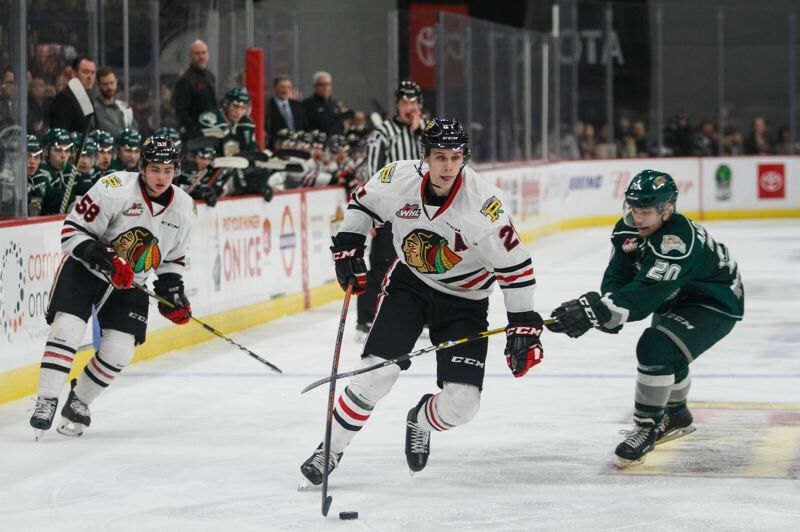 "Our scouts did a great job identifying him as a player because he has the intelligence … and for a guy that's as big as he is, he can really get up the ice," says Kyle Gustafson, Winterhawks associate head coach and assistant general manager. "That's what excited us. He always had that skating ability." A sixth-round pick of the NHL's Carolina Hurricanes in 2017, De Jong understands he must get stronger to last in professional hockey. Besides his skating, De Jong's value to this year's Winterhawks comes from his leadership and his ability to take on a variety of assignments. "He gives us size. He's a great skater. He can lug the puck up the ice," Johnston says. "I just think he gives us so much confidence. When you have mature guys on the back end like Brendan and (Jared Freadrich), it settles your team down. It's calming when you have guys like that out there on the ice." De Jong was anything but calm in his first game for Portland on Sept. 19, 2014, against Seattle. "I was lined up for a face-off in the offensive zone and the puck dropped and I fell over right away," he says with a smile. "I was shaking a bit. I was pretty nervous." Developing confidence was a significant part of his growth over the seasons that followed. And it's why De Jong has high hopes for Portland's current crop of rookies, which includes defensemen Nick Cicek, Nick Perna and Kade Nolan. "You can already see with our young guys they just exude confidence. I know for me (gaining confidence) was a huge thing over the years," De Jong says. His primary partner this season has been second-year defenseman Clay Hanus. De Jong says the 17-year-old Minnesotan is right up there with his other successful blue-line brothers and "will be a star in this league." De Jong has not been a star. But he credits Jamie Kompon, the Portland head coach when he arrived, along with Johnston, Gustafson and the Winterhawks organization for teaching him the importance of details. Gustafson, who has been a constant on the coaching staff and responsible for coaching defensemen, says there is still plenty of growth potential in De Jong's game. Gustafson's first impression of De Jong five seasons ago? "His decision-making with the puck, his ability to defend and have a great stick," Gustafson says. "You saw a glimpse of who he's going to be as a hockey player. Now we're starting to see him as almost a pro." De Jong has experienced a couple of WHL playoff series victories with the Hawks, and he wants to keep this ride going as long as possible before worrying about the future. "There have some big series wins and things like that, but it really comes down to the friends I've made. All my years here we've had tight groups and unbelievable guys," he says. "My time in this league has flown by. At this point, I'm just soaking everything up." For a few more months, his younger teammates can soak up knowledge from De Jong, too. WHL teams are limited to three 20-year-old players, and those veterans help define each season. "I think he understands our core values as a team," Gustafson says. "He understands how to treat young guys and the expectations of a 20-year-old because he's had a lot of good ones before him. "As an organization, that's what we want. We want to grow our (own) 20s. … If you can have grown 20s such as Brendan and Joachim (Blichfeld), it goes a long way."